The Desert Sun Mining & Gems Corporation is the world's largest supplier of all natural Oregon sunstones, producing approximately 3 million carats each year from its operations at the Ponderosa Mine, located in the high desert of Eastern Oregon. Our production accounts for roughly 80% of the natural sunstone available on the market today. In 2003, John and Talley Woodmark, along with their good friend Bruce Moore, founded the Desert Sun Mining & Gems Corporation (DSMG). After purchasing 100 acres of Sunstone claims in the Rabbit Basin, and then successfully negotiating the acquisition of the world famous Ponderosa Mine, their vision to establish Oregon sunstone as a premier colored gemstone quickly became a reality. DSMG has worked hard to earn its sparkling reputation through their commitment to consistent high-quality, exceptional customer service, and competitive pricing. 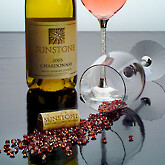 The sunstones produced by DSMG are found in a wide array of colors from amber golds and peachy orange gems, to rare pink and sherry reds. It is also offered in brilliant blue/greens, clear champagne, and vivid tri-colors. DSMG is the world's only source of Ponderosa Red Sunstones, which have become the company's signature stone. As a mine to market organization, you can expect dedicated customer support in every facet of our operation. We are much more than a product supplier; we are partners in your success. You can be assured that DSMG maintains strict quality control over every piece of rough that we mine and gemstone that we cut. It is our desire to enhance our customers' lives by supplying them with the largest and most diverse inventory of calibrated gemstones, cabochons, carvings, rough, and beads of Oregon sunstone in the world.